After we've taken the risotto out of the oven, we let it rest for a minute. This point in the process is called the "mantecatura", which means to skim. We mix in the cheese, which not only gives it extra flavour and creaminess, but also smoothens the texture of the risotto. Add KNORR Vegetable Booster to 1L of boiling water. Heat some olive oil and sauté the shallot and KNORR Garlic Puree without browning. Add the rice and cook until translucent. Add the chicken stock and stir well until it comes to a boil. Put a lid on the pan and place in a preheated oven at 185 degree Celsius for 18 minutes. Remove the risotto from the oven and check that it is tender and smooth. Let the risotto rest for a minute, then stir in the cheese. Clean the sugar snaps and pod the broad beans. Blanch all the vegetables and season with salt and black pepper. Divide the risotto over the plates. 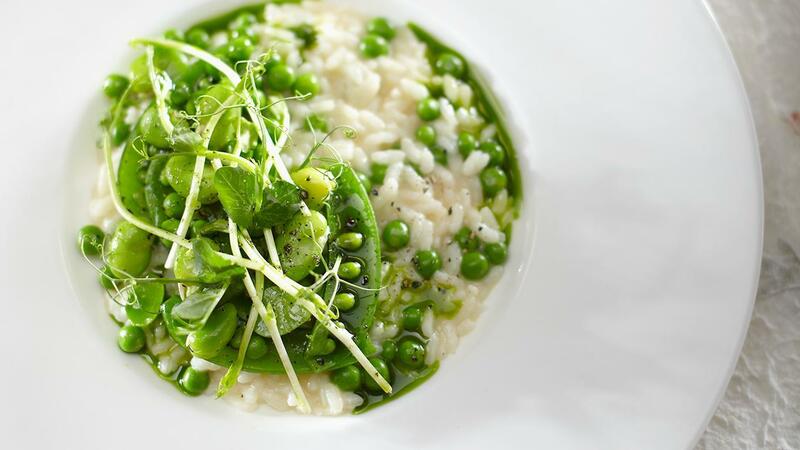 Arrange the vegetables on top and garnish with pea shoots. Finish off with some parsley oil and a sprinkle of black pepper.